There are many different kinds of stratocumulus clouds, which are dark, puffy, low-lying clouds that seem like rain but won't give you any. One type is a fairly rare type called the stratocumulus castellanus. This is a type with a very significant shape that occurs in specific instances. You may have to look a little harder, though, because this type may be a little harder to catch than most. What are stratocumulus castellanus clouds? Stratocumulus castellanus clouds are a type of specific stratocumulus cloud that has a flat bottom with a cumulus-like top. These specific dark, heavy clouds are very commonly referred to as storm clouds or rain clouds, but this is actually a common misconception. They actually don’t produce any rain at all. This is only one of a long list of specific types of stratocumulus clouds. 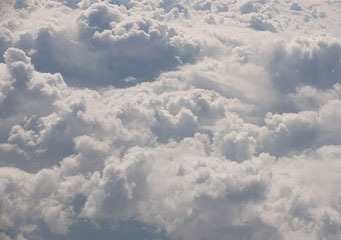 What height are stratocumulus castellanus clouds found? Like all other types of stratocumulus clouds, this particular kind of cloud is very low-lying. They only sit about 8,000 feet in the air, which is often lower than a plane flies. This may make these clouds seem a lot heavier because they are, in fact, so incredibly close to the ground. Stratocumulus castellanus clouds are one of a list of about half a dozen particular types of stratocumulus clouds. These clouds all have their own particular causes and appearances, this type included. How are stratocumulus castellanus clouds formed? Stratocumulus castellanus cloud types actually occur when flat stratus clouds rise up to form stratocumulus clouds. This creates a very flat bottom and a puffy top that looks more like a cumulus cloud. The dark bottom makes people think that rain will fall from the clouds, but once again, they really don’t produce much precipitation at all. What do stratocumulus castellanus clouds look like? They are flat on the bottom. They are always a little dark grey as if they would produce rain. They are heavier on the bottom than on the top. They will be large and low to the ground. The top is puffy like a cumulus cloud. How common are stratocumulus castellanus clouds? Stratocumulus castellanus clouds are common, but sort of fleeting due to the fact that they are more of a stage in a cloud change than anything at all. They can quickly transition into cumulus congestus or cumulohimbus clouds if they are allowed to rise enough. Where can I see stratocumulus castellanus clouds? If you look on a warm afternoon that is bright but has humidity that is quickly lowering, you will no doubt be able to catch one of these particularly transient clouds. For example, if you look after a rain, you can catch a glimpse of one. Look for stratus clouds that are rising up to become a different kind and you will no doubt see a stratocumulus castellanus cloud.